If Texas state Rep. Eric Johnson had anything dramatic in mind when he filed House Bill 100, he didn’t let on. The Dallas Democrat’s bill doesn’t make any pronouncements about changing the state’s historically do-little approach to climate change. It doesn’t press for a faster abandonment of coal in favor of wind and solar power. It doesn’t set goals for reducing Texas’ emissions of climate-warming carbon dioxide, which have been the nation’s biggest for years. Johnson’s bill doesn’t even mention climate change. Its term is “climate variability,” avoiding a phrase that, although it describes a scientific reality, also invokes a political reaction. “We don’t see any issue with the term climate change versus climate variability; they’re synonymous to us,” Johnson told Texas Climate News in an email. HB 100 would mandate just two things. First, 11 state agencies dealing with the environment, natural resources, agriculture, public safety and natural disasters would report, in their already required strategic plans, how climate change’s effects might lead to changes in their operations. Second, the Texas state climatologist, the state’s designated expert on climate, would tell the Legislature every other year how a changing climate is affecting – and is likely to keep affecting – Texas’ droughts, floods, sea-level rise, soil moisture, water supplies, river flows and so forth. If it sounds like just good planning – and, politically speaking, mildness incarnate – that’s the impression Johnson was after. Although most bills filed in January are dead by May, he’s hoping the memory of 2017’s catastrophic flooding in Houston from Hurricane Harvey boosts HB 100. His bill isn’t alone. A half-dozen others would at least nudge the state toward having a policy on climate change. Three bills call for the creation of advisory panels – a Global Climate Change Commission, a Global Climate Impact Assessment Council and a Texas Climate Change Mitigation and Adaptation Commission. Another would mandate a state climate change study by Texas A&M climate scientists. One bill would require relevant state agencies to write climate adaptation plans. And HB 2558 by Rep. Erin Zwiener, a first-term Democrat from unincorporated Driftwood in Hays County, would protect any state employee “who in the course of employment refers to climate change, global warming, or the effects of those phenomena.” The bill is a response to Texas’ unwritten but oft-exposed policy of avoiding mentions of climate change in state reports. None of the 2019 climate bills has been scheduled for a committee hearing, the first of many steps needed for passage. With the legislative session more than half over, their prospects don’t look good. Being denied a hearing – it’s the call of a committee chair – is the leading cause of bill deaths. That’s been the fate of virtually every bill related to climate change in Texas. For years, Democratic legislators have pushed for climate adaptation and mitigation plans, advisory commissions, scientific studies and other steps. Johnson has tried versions of his bill before. Rep. Rafael Anchia, of Dallas, and former Sen. Rodney Ellis of Houston, now a Harris County commissioner, are veteran authors of many failed climate bills. 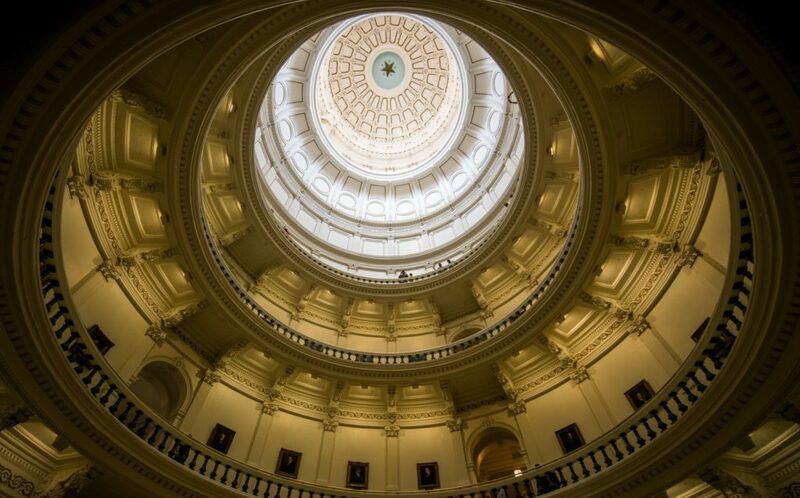 A review of legislative records by Texas Climate News found that since 2009, at least 11 climate bills have died without hearings in committees. Others received hearings but committees never voted on them. A few got out of committees without being voted on by the full House or Senate. One – Johnson’s 2015 bill to require 20- to 50-year climate forecasts by the state climatologist, and to require state agencies to listen to him – got a House vote but failed, 84-47. Some bills that nibbled at climate’s edges have succeeded – bills dealing with energy efficiency, for example. But of 21 bills from 2009-2017 that directly addressed climate change, only one became law: then-Sen. Troy Fraser’s 2011 effort to protect industries from lawsuits over their greenhouse-gas emissions. It was signed by then-Gov. Rick Perry, now President Donald Trump’s energy secretary. John Nielsen-Gammon’s name isn’t in Johnson’s bill, but his title is. In addition to being regents professor in Texas A&M’s atmospheric sciences department, he’s also the Texas state climatologist. In that role, he reports on Texas weather and climate to help identify risks from, among other things, droughts and floods. The Legislature has repeatedly rejected bills that would have ordered or encouraged Texas agencies to tap the state climatologist’s expertise when they write policies and plans. Johnson’s bill, HB 100, is one more attempt. If it becomes law, Nielsen-Gammon’s phone might ring more often. As things are now, if his phone does ring, it’s unlikely to be a Texas state agency. For the most part, asking about the climate appears to be something that’s just not done. “Presently I’m not involved in any long-term planning for state agencies,” Nielsen-Gammon told Texas Climate News in an email. He did contribute data to the state’s 2018 hazard-mitigation plan, he said, but that looks only five years out, a relative blip compared to the decades-long strategies many climate-change experts advocate. Nielsen-Gammon said his knowledge is available if the state wants it. “I can provide valuable and useful information to state agencies whenever their long-range plans require making assumptions about future weather and climate conditions,” he said. Given recent disasters such as 2017’s Hurricane Harvey in Texas and last year’s Hurricane Michael in Florida, even states that don’t talk much about climate change are talking more about adapting to worsening weather. Current terms of art include resilience and hazard mitigation – having the capacity to absorb blows from weather and other risks – often without admitting that greenhouse gases are worsening things by raising average temperatures. Texas’s latest hazard-mitigation plan, last October, was meant to summarize all the natural things that might kill Texans or destroy their homes or businesses over the next five years. But a reader would never learn that emissions-induced climate change is projected to make Texas’ inland and coastal flooding more dangerous in the next decades, or that heat-related deaths are projected to rise. “Climate change” does appear seven times in the state’s 477-page report. But it’s only in the footnotes. Randy Loftis, an independent journalist in Dallas, is a senior editor of Texas Climate News.